Welcome to the X-trip Japan homepage! 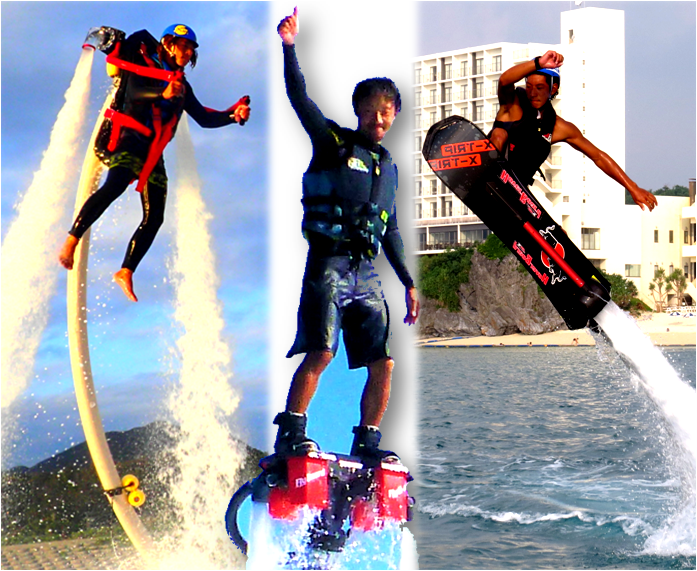 We are a water sports company based in Nago city, Okinawa. Located just 15 minutes from the Okinawa aquarium, we provide the finest of ocean activities available. From flying through the skies on the back of our parasailing parachute, to exploring the floors of the ocean scuba diving, we have a wide range of activities availabe for you to enjoy! Become the Iron Man of the water with the flyboard or skim the water and soar through the sky on the freshly released hoverboard! Our staff will teach you how to ride these gravity defying beasts while you can enjoy the new generation of extreme sports! 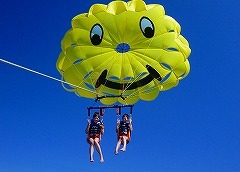 Enjoy a thrilling yet oddly relaxing ride throught the air with our parasailing course! The cool breeze while gliding through the air id perfect in the tropical climates of Okinawa. Fly over 50 metres in the air while enjoying a 360 degree view of the islands beautiful coastline. ※Parasailing may be cancelled on the day depending on the strength of the winds. Experience diving for the first time in the glamorous oceans of Okinawa! Our diving location at Minna Island is one of Okinawa's clearest oceans full of Okinawa's exquisit coral reefs and tropical fish. Our professionally certified staff will ensure you are completly comfortable and safe while you enjoy the best view of Okinawa's ocean underwater. 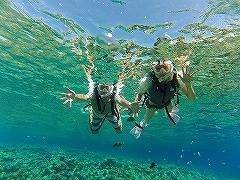 Enjoy the ocean of Okinawa afloat with our snorkeling course! Start the tour with a cheeky banana boat ride to a location filled with Okinawa's wide range of tropical fish and stunning coral reefs. Swim with the friendiest fish you've ever seen at our Sesoko Island location! If you're lucky you may even find nemo. He got lost and settled down in the anemone in Okinawa. Revel in a surge of adrenaline with our marine pack! Get towed on the back of a jet ski in the bouncy banana boat, then feel the forces of gravity while you get spun around on our tube, the Super Mable. Finally, experience what it really feels like to freely move afloat the ocean on the back of a jet ski! The intensity of the rides is all up to you, so it can be enjoyed by anyone, from kids to adults. ･Please note that women who may be pregnant cannot participate. ･People with certain medical conditions may not be able participate. If uncertain, please contact us in advance. ･For prior preparation (wet suits, flippers etc) and due to certain limitations, please don't forget to fill out age, height, weight and foot size accurately when making your booking. ･Please make your reservation at least one week in advance. ･During July and August we are very busy and chances are we are full, so please make your reservation early. ･If you don't inform us of the name of the hotel in advance, we can't make contact with you so please be sure to let us know. ･Please fill out a registration form in advance , then send it by e-mail. ･Minors (Under 20) require a parent's signature on a registration form. ・Please take motion sickness drugs if needed. Due to the uncertainty of location, for consistecy we accept cash only. ･Please come 30 minutes before your reservation time. ･Since it is local set and local dismissal, we ask you to travel by car. ･Venue might change depending on the state of the ocean, so we will contact you to confirm the meeting location the day before. We have 2 main base locations: One at Hotel Resonex Nago, and our own shop at Motobu Okinawa (google map locations above). We will contact you the day before to inform you at which location to meet. If you are staying at a hotel, we will also send a map to the chosen location to the front desk of the hotel. Please send a registration form by e-mail one week before the participation. The day before the implementation date (17:00-19:00), we will FAX details such as the schedule and the meeting place to the front desk of your hotel. Copyright © 2019 X-TRIP All rights reserved.